Frog makes the cutest noise! See the video on the link below. Could this be the world's cutest frog making the world's most adorable noise? 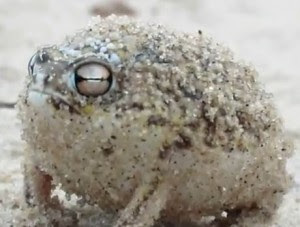 Dean Boshoff shot this video of a Namaqua Rain Frog. He found the cute little critter in sand dunes along Port Nolloth in South Africa. Namaqua Rain Frogs are burrowing creatures that spend most of their time underground. They're also less than 5cm long.